The mouse went down on the widget. The window was closed. Optional parameter: pointer to the window. The window was minimized. Optional parameter: pointer to the window. The window was maximized. Optional parameter: pointer to the window. The escape key was pressed while the child window was focused. Optional parameter: pointer to the window. Places the title on the left side of the title bar. Places the title in the middle of the title bar. Places the title on the right side of the title bar. Try to close the window. This will trigger the Closed signal. If no callback is requested then the window will be closed. Makes a copy of another child window. Creates a new child window widget. When no callback is requested when closing the window, this function will be called automatically. When you requested a callback on close then you get the opportunity to cancel the closing of the window. If you want to keep it open then don't do anything, if you want to close it then just call this function. Returns the distance between the position of the container and a widget that would be drawn inside this container on relative position (0,0). Returns the size of the full child window. The size returned by this function is the size of the child window, including the title bar and the borders. Returns the maximum size of the child window. The size returned by this function is the maximum size of the child window, excluding the title bar and the borders. Returns the minimum size of the child window. The size returned by this function is the minimum size of the child window, excluding the title bar and the borders. Returns the title that is displayed in the title bar of the child window. Returns the title bar buttons. Returns the character size of the title. Tells whether the child window is kept inside its parent. When it's set to true, the child window will always be kept automatically inside its parent. It's set to false by default. Checks whether the child window can be moved by dragging its title bar or not. Is the child window frozen at its current position? Checks whether the child window can be resized by dragging its borders or not. Can the user change the size of the window by dragging one of the borders? Sets the child window to be kept inside its parent. enabled When it's set to true, the child window will always be kept automatically inside its parent. It's set to false by default. Sets the maximum size of the child window. This function sets the maximum size of the window excluding borders and titlebar. If the window is larger than the new maximum size, it will automatically be shrunk. Sets the minimum size of the child window. This function sets the minimum size of the window excluding borders and titlebar. If the window is smaller than the new minimum size, it will automatically be enlarged. Sets the position of the widget. Changes whether the child window can be moved by dragging its title bar or not. positionLocked Is the child window frozen at its current position? Locking the position only affects user interaction, the setPosition function will still move the window. Changes whether the child window can be resized by dragging its borders or not. resizable Can the user change the size of the window by dragging one of the borders? Changes the size of the child window. This is the size of the child window, without the title bar nor the borders. Changes the title that is displayed in the title bar of the child window. alignment How should the title be aligned in the title bar? buttons Which buttons should be available in the title bar? By default ChildWindows only display a close button. 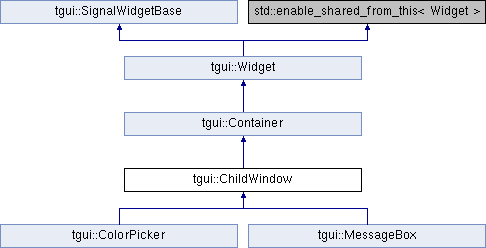 The following example gives the ChildWindow both a minimize and close button. Changes the character size of the title. size The new title text size. If the size is set to 0 then the character size is determined by the height of the title bar.